You won’t be able to stop snacking on these buttery garlic and herb Homemade Croutons – they just may not make it into the salad! 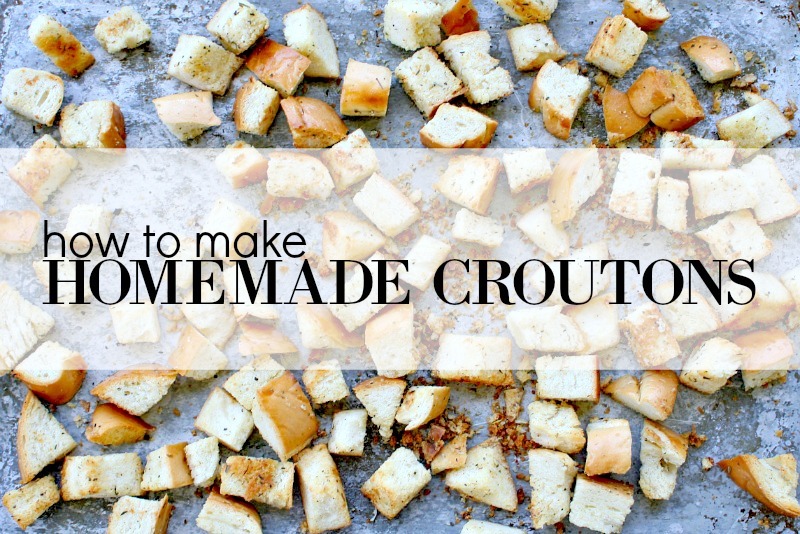 I started making these homemade croutons when I was 15 years old – a time when I wouldn’t even touch a salad unless there were croutons in it (in addition to an offensive amount of dressing). Homemade anything is always better, but with the word “homemade” comes the notion that you need loads of time to accomplish it. But that’s not the case with crunchy bits of joy! In less than 30 minutes, you’ll be snacking on buttery golden crisp croutons that might not even make it into the salad. I know this from experience. I REGRET NOTHING. I went with garlic and herb flavors for this recipe, but feel free to season your croutons however you’d like. You can stick to basic flavors or, if you’re feeling adventurous, get creative and use seasonings like chili or curry powder! I’m just here to show you how simple it is. You want to plan slightly ahead. Score yourself a fresh loaf of French or Italian bread a few days in advance. Much like when you make stuffing for Thanksgiving, you want the bread to be firmed up a bit – and by firm, I don’t mean stale. We don’t need it hardened to the point where it could knock out a small child. Cut the bread into 1-inch slices, and then cut the slices into 1-inch cubes. These make really nice bite-sized croutons! When done, transfer your cubed bread pieces into a large bowl and start seasoning. You’ll kick things off by drizzling the melted butter and olive oil over the bread. Follow that up with your dry seasonings and, with clean hands, gently toss the bread cubes around until all of them are as close to being evenly coated as possible. Transfer the bread pieces to a baking sheet and spread them out for even baking. Put them in the oven, mid-rack, and let them bake for 15-20 minutes, or until golden brown. Set them aside and allow them to cool. Once cooled, transfer them to an airtight container and store in a dry place. They’re good for a week! You won't be able to stop snacking on these buttery garlic and herb Homemade Croutons - they just may not make it to the salad! Pre-heat oven to 350 degrees F with rack positioned in the middle. Cut bread into 1-inch cubes and transfer to a large bowl. Drizzle the melted butter and olive oil over the bread. With your hands, gently toss the the bread around to coat as evenly as possible. Transfer the bread pieces to a baking sheet and spread the pieces out evenly. Place the baking sheet in the oven for approx. 15 - 20 minutes or until golden brown. Set aside to cool. Once cooled, store in an airtight container for up to a week. Homemade croutons are the best, plus hopefully has none, or less less preservatives than the packaged kind! Love the bright, airy photos too! Agreed, homemade everything is awesome! I'd totally snack on those. So true, homemade is ALWAYS better! Sounds like a perfect blend of seasonings on these croutons. Delicious! I love homemade croutons, in fact I made a batch just yesterday! I never buy croutons, they are so expensive and you can't control what is in them! I have never used butter, I'll have to try that. Do you say they are only good for a week because of the butter? With olive oil mine last for months.